Two species of cucullanid nematodes collected from the intestine of marine fishes off New Caledonia were studied with the use of light and scanning electron microscopy (SEM): Dichelyne (Cucullanellus) bodiani n. sp. from Bodianus perditio (Quoy & Gaimard) (Perciformes: Labridae), characterised mainly by the small size of the body (males and gravid females 2.26–3.13 mm and 2.46–3.32 mm long, respectively), the presence of very long spicules (1.53–1.66 mm in length), the remarkably large seminal vesicle and the arrangement of caudal papillae, is the second known species of Dichelyne Jägerskiöld, 1902 parasitising fishes of the Labridae and the second nominal species of this genus recorded from fishes in New Caledonian waters. Cucullanus hansoni Olsen, 1952, originally described from Hawaii, is now, after 67 years, again reported from its type-host, Sufflamen fraenatum (Latreille) (Tetraodontiformes: Balistidae), from off New Caledonia. The SEM examination of C. hansoni, used in this species for the first time, revealed some new morphological details, such as the presence of a median precloacal cuticular elevation or the shape of deirids and distal tips of spicules, as well as the exact location of caudal papillae and phasmids in the male. This is the seventh species of Cucullanus Müller, 1777 recorded from fishes off New Caledonia. This article was registered in the Official Register of Zoological Nomenclature (ZooBank) as urn: lsid:zoobank.org:pub:05DC1207-176F-48E6-899A-FD8F6773CE4D. This article was published as an Online First article on the online publication date shown on this page. The article should be cited by using the doi number. This is the Version of Record. This article is part of the Topical Collection Nematoda. 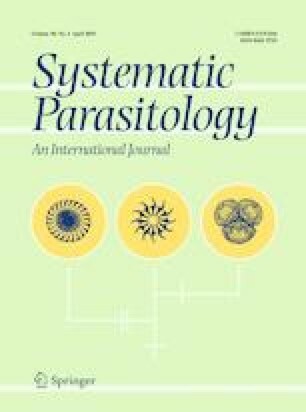 The following colleagues and students were involved in the parasitological survey: Milan Gelnar, Eva Řehulková, Aude Sigura, Lenaïg Hemery, Géraldine Colli and Isabelle Mary. Thanks are also due to the Laboratory of Electron Microscopy, Institute of Parasitology, Biology Centre CAS, institution supported by the MEYS CR (LM2015062 Czech-BioImaging) for their support with obtaining scientific data presented in this paper, and to Blanka Škoríková of the same institute for help with the illustrations. This study was partly supported by the institutional support of the Institute of Parasitology, BC ASCR, 585110/9500). Froese, R., & Pauly, D. (Eds) (2019). FishBase. World Wide Web electronic publication. http://www.fishbase.org, version 01/2019.